There’s an old saying in rehab that refers to “stepping over bodies.” It refers to the need to continue forward with your sobriety and recovery while others in your recovery circle are relapsing. 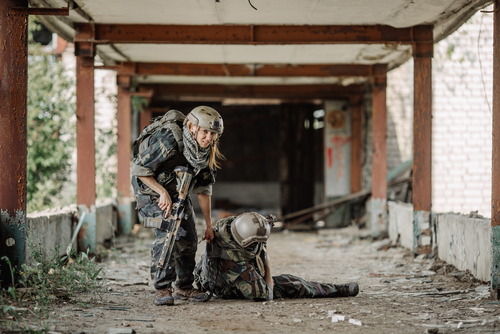 Leaving the dead and wounded on the battlefield may run against every human instinct you have, but when you’re recovering from an addiction to drugs or alcohol, you may have no choice but to move forward and disregard the carnage around you. Successful recovery requires you first to commit to yourself. Your friends and acquaintances who can’t or won’t make that commitment are harming themselves, and you need to cast them aside or risk having them drag you down with them. Your recovery counselors will impress upon you the importance of developing a social network and a circle of friends who are willing to provide support and encouragement to keep you away from your addictions. If your old friends are still using drugs or alcohol and are encouraging you to do the same, your counselor will tell you to jettison them. Even if they were your closest friends and companions during your addiction days, you will jeopardize your recovery if you don’t leave them behind. Rehab and recovery are more than just going through physical withdrawal. You’ll need a wholesale behavioral change and a new group of friends who are committed to helping you make that change. If you’re guilty about cutting old ties, lean on your new friends and counselors for help. They can talk to your old friends with you and help you sever the relationships that can harm you. You may even be helping your old friends to realize their own addiction problems if you cut them out of your life. If they later reach out to you for help, they will have taken the first step toward the deeper commitment that they’ll need to defeat their addictions. Understand that you may suffer immensely if you remain close to someone who keeps to his or her addictive ways or who experiences a relapse. You’ll need to stay emotionally detached from those people to avoid your own relapse. If you do stay close to them and you’re watching them go through the pains of physical withdrawal, you might be tempted to enable their addictions to ease that pain. Your counselors will recognize these traps and will help you to avoid them and to manage the difficulty of turning a blind eye to a friend’s suffering. With time, you’ll learn to develop a more casual sense of detachment from friends and acquaintances who won’t help themselves. Your senses of humanity and empathy will allow you to mourn for them and their illnesses, but your commitment to your own recovery will enable you to walk past the sick and over the dead bodies who have allowed their addictions to defeat them. You’ll be dealing with an explosive tinderbox of emotions throughout the entire course of your addiction recovery. You may need help in dealing with those emotions that make you want to stay on the battlefield to tend to the sick and the dying. The staff and counselors at Hired Power can help you deal with these emotions and can provide the tools you need to help yourself first and foremost. Please call us at 800-910-9299 for more information and assistance.